The final saw over 250 students from 34 nations across Europe come to Britain for three days of competition (17-19th July). Winning team member, Thorny Valk, was delighted to win saying, "Winning was perfect - we put in so much work and now we've got this award. The company we've built is amazing and we're doing what we want, so it's really cool. It's really overwhelming! We've already founded Three Little Pigs as a real company, so there are big plans for the future!" The runners up were the Spanish team Sun O’clock, who created a bracelet that indicates when sun cream should be reapplied and the German team KraGü who made fashion items. The teams were part of Junior Achievement and Young Enterprise flagship Company Programme, which sees students set up and run real businesses with the support of business mentors. 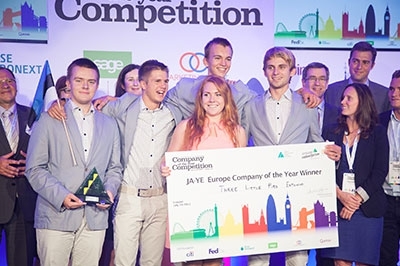 The Company of the Year Competition is Junior Achievement and Young Enterprise’s annual celebration of the achievements of their very young entrepreneurs and their mini-companies from across Europe. 230,000 students took part this year in the Company Programme and competed at the national level for the “Best Student Company”. Young Enterprise, the UK branch of Junior Achievement is the largest enterprise education charity in the UK and this year 26,000 students took part in the Company and Team Programmes across Britain. In the process they set up more than 2,000 companies between them that have altogether turned over an estimated £2 million. FedEx’s Access Award for the most comprehensive understanding of global trade and its effect on the nature of business went to the Finnish company RikuCo who sell, buy and repair gaming equipment. “The decision to award the prize to the Finnish retro video games trading company, RikuCo, was an easy one. The judges feel that RikuCo has a proven track record of global trade, a commitment to job creation and has a sustainable business model based on its recycling of video games. Therefore RikuCo is a perfect fit for FedEx philosophy of access,” said Gregory Morsbach External Communications Manager, FedEx Express EMEA. NYSE’s Euronext Award for the mini-enterprise with the most creative and efficient business model as well as understanding the value of extraction across the team went to the Danish team, Faroese Sea Salt, who produce flavoured sea salt from the unique nature surrounding the Faroe Islands. The Marketing Trust’s Excellence in Marketing Award for the firm that demonstrated the best market research, brand development as well as addressing successfully the place, the price and the promotion of the product went to the Spanish team Sun O’clock, who created a bracelet that indicates when sun cream should be reapplied. Sage’s Financial Management in Business Award for those who demonstrated the best understanding and management of their financial systems across the whole company went to the Greek team, REVOROOTION INC, who trade in the automated irrigation systems market. Citi’s Entrepreneurial Spirit Award, given to the company who displayed the greatest amount of entrepreneurial spirit and innovation, went to the Irish team FARM for The Cow Tail Lifter, which prevents dairy farmers getting kicked by their cows. Competing nations at this year’s final were: Albania, Austria, Belgium Flemish, Belgium French, Bulgaria, Czech Republic, Denmark, Estonia, Finland, France, Germany, Greece, Hungary, Iceland, Ireland, Isle of Man, Israel, Italy, Latvia, Lithuania, Luxembourg, Malta, Netherland, Norway, Poland, Portugal, Romania, Russia, Serbia, Slovakia, Spain, Sweden, Switzerland, Turkey, and the United Kingdom. JA Europe (www.jaeurope.org) is Europe’s largest provider of entrepreneurship education programmes, reaching 3.1 million students in 38 countries in 2012. Funded by businesses, institutions, foundations and individuals, JA Europe brings the public and private sectors together to provide young people in primary and secondary schools and early university with experiences that promote the skills, understanding and perspective that they will need to succeed in a global economy. The JA Europe Company Programme is recognised by the European Commission Enterprise Directorate General as a ‘Best Practice in Entrepreneurship Education’. JA Europe is the European Regional Operating Center for JA Worldwide®. Young Enterprise is the UK’s leading enterprise education charity. Every year Young Enterprise helps 250,000 young people aged between 4 and 25 learn about business and the world of work in schools, colleges and universities. The students do this under the guidance of a network of 5,000 volunteers from 3,500 companies. This year more than 26,000 young people are taking part in our flagship Company Programme.